If you read our blog, then you might already know that Amsterdam has some of the world’s best-designed bike infrastructure, which helps explain why over half of all commutes in the Dutch city are by bike. This has lots of benefits—less traffic congestion, better health, safer streets—but it also poses a surprising problem: where to put all those bikes when people aren’t riding them. In residential neighborhoods, the solution is bike racks and corrals, often mounted on sidewalk bump-outs in quiet side streets. But what about places where everybody wants to park? When Amsterdammers take the train, go to the library, work in a big office park, or see a movie or concert, they often arrive by bike. At places this popular, a few racks won’t cut it. Enter the underground bike garage. Most Dutch cities have a few of them; Amsterdam has over 20. To American ears, it might sound extreme to dig out a garage just for bikes, but it’s not really that different from the bike rooms that office and apartment buildings in the US increasingly offer. In both cases, the idea is simple: provide a safe, easily accessible, weather-protected place to park, and people are more likely to make biking a habit, and not take up so much expensive car parking. In the Netherlands, the logic (and benefits) are just scaled up to the city level. Here’s one example of a gemeentelijke fietsenstallingen (municipal bike parking) garage. This one’s next to Paradiso, a legendary concert hall and nightclub located in a converted church next to the Singelgracht canal. A lot of thought goes into the design of garages like these, starting with getting in and out. Larger garages often have ramps or moving walkways, but this is a relatively small fietsenstallingen, so you take the stairs. Notice, though, that there are small channels on either side to roll your bike down. On closer inspection, these turn out to be more than just ramps. The “downhill” channel on the right side is lined with stiff bristles that grip your bike tire and slow its decent. The “uphill” one is actually a tiny conveyor belt! — simply roll your bike onto the yellow strip, lock your brakes, and it automatically starts moving, carrying your bike up the steps while you walk alongside. Because space is at a premium, nearly all garages use double-decker parking, with an elevated row of racks that slide out and tilt down on a small pneumatic piston. This allows for incredible density: Amsterdam’s newest bike garage in the Strawinskylaan office district holds 3750 bikes, but fits underneath a road overpass. Most garages are staffed and guarded, and charge a (very small) fee for secure, overnight parking, which you pay with a debit or transit card upon check-out. The larger ones also offer bike repair stands, in case you need to make an adjustment or fix a flat before heading out. And some of them are quite beautiful. Interested in adding a little Dutch-style convenience to your office, residential, or municipal development? Our range of racks and furniture is extensive, and we customize for just about any situation. We all know this time of year brings plenty of cold, wet conditions to the Pacific Northwest. But that doesn’t have to mean putting the bike away until spring. From bike commuting to recreational riding, or even heading out for some last-minute holiday shopping on two wheels, anyone can enjoy winter cycling in less-than-ideal conditions, it’s just a matter of being prepared. Here are six winter gear essentials that every bicyclist should own. We’re including a few examples of our favorites in each category. We’ve found that these pieces fit and perform well without breaking the bank, but there are plenty of options out there that will get the job done. (No one’s paying us to say this, we swear. We just really, really appreciate good gear.) We recommend always comparing products, reading customer reviews, and considering personal preference and individual needs when choosing gear—whether it’s for you or that die-hard cyclist on your list. It’s easy to overdress for cold-weather riding, but our bodies produce plenty of warmth as soon as we start pedaling. The key to comfort is wearing layers that are waterproof, breathable and sweat-wicking. Choose a base layer made of Merino wool or any synthetic wicking fiber like polyester or nylon/spandex. Avoid cotton, it will soak up sweat and hold it next to the body. Check out the Gore Windstopper base layer. It’s a versatile and comfortable long-sleeve that does well to block wind and manage moisture. At around $80 it’s an excellent baselayer with an attractive price tag. Again, you don’t need a lot of warmth from a cycling jacket. Focus on finding a lightweight shell that’s waterproof and breathable. You can always add an extra layer underneath for especially chilly days. Look for a jacket with a Durable Water Repellent (DWR) treatment, which makes water bead and roll off. The Double Century RTX jacket from Portland-based Showers Pass is a lightweight and super-functional shell with a drop hem in the back for extra protection. The easy solution here is to throw a pair of pullover rain pants on top of your standard everyday slacks—the Marmot PreCip Pant performs well for its minimal price tag of around $55. But affordable options can be ill-fitting and not durable, making them prone to catching, tearing or wearing through. If you’re willing to spend a little more, the Arc’teryx A2B Chino and the Coalatree Trailhead Pant are solid entries in the multi-function pant category. Both offer flexibility with a water-repellent finish, and look just enough like your business-casual slacks to fit right in at the office or coffee shop. Hands don’t benefit from all that body heat that the legs and torso get from pedaling, so a good set of gloves is one of the most important pieces of gear for a safe and enjoyable winter ride. Look for gloves that are waterproof, or at least water-repellent. Durable materials like leather on the palms add protection in case of a wipeout, and silicone details on the fingers and palms can give you a secure grip even in the rain. Sealskinz Dragon Eye Gloves are durable and close-fitting, with great dexterity for a range of activities. Bike fenders have come a long way from the rattling chrome monstrosities of the ‘60s and ‘70s. Most fit easily onto virtually any bike frame, and can be quickly attached and removed depending on the weather. Of course, fenders block water from spraying up onto the rider, but more importantly they can prevent mud, sticks and other debris from launching into bike wheels and drivetrains, which can prevent accidents and save on repair costs in the long run. Planet Bike’s Cascadia fenders are a solid choice for full-fender coverage, and the SKS Xtra-Dry is a surprisingly-effective rear mudguard that attaches in a snap and retails for under $20. Powerful, dependable lights are a good idea to carry any time of year. But that’s especially true in the winter months, when daylight hours are limited and rain reduces visibility even further. Whether you’re riding on city streets or rural roads, it’s important to consider not only how well you can see, but how well you can be seen. Consider how long, how often, and in what setting you’ll do most of your night riding, and look for a set of lights that fits your needs. Serfas offers a wide selection from permanent-mounts to quick-release and everything in between. The Blackburn 2-Fer Combo light is USB rechargeable and keeps you visible to other riders and drivers. Each light is interchangeable, with toggling headlight and taillight settings and a quick-release clip. Versatility and a modest price tag make the 2-Fer a great entry-level option. These are just a few examples of the quality winter-weather cycling products available. Hopefully this list provides some insight and a solid place to start your search. Experiment with what works best for you. Consider function and price point. Most importantly‚ enjoy the ride! Portland State University just celebrated the grand opening of the Karl Miller Center, a state-of-the art facility featuring a bright, open atrium. This eye-catching building is a campus jewel, so the bike racks slated for installation right outside need to look the part. Clint Culpepper, the Bicycle Program Coordinator at PSU, could have purchased brand new racks to install, but utilizing refurbished bike racks better aligns with the university’s focus on sustainability. “Nothing would make me feel worse than turning a bunch of bike racks that were totally usable and serviceable into metal recycling just to buy brand new ones,” he said. Last year Clint enlisted the services of Huntco Site Furnishings to transform dozens of old, beat up staple racks into freshly painted bike corrals, and he decided it was time to refurbish a second batch. From Clint’s perspective, the hardest part of the process is ensuring there is adequate capacity for bike parking while the old racks are removed and refreshed. The rest is as easy as making a phone call. Huntco picks up piles of assorted staple racks, sorts them, and welds matching racks onto sets of rails to make bike corrals. Fresh powder coating is applied and then the corrals are delivered back to PSU, looking good as new and ready for installation. The updated bike corrals don’t just benefit campus cyclists. “Everyone on campus likes it when the bike racks look nice,” Clint reports. Not every user of a building wants to have a bike rack sitting right outside the front door, but there’s less resistance when the racks look good. So when the next batch of refurbished racks is delivered in a few weeks, rest assured that the Karl Miller Center will get the dazzling accessories it deserves. Every city has orphaned lots: those islands of land stranded by an unfortunate intersection, too small or oddly-shaped to build on. But while some linger as undignified patches of asphalt or concrete, others become true neighborhood amenities, often because of smart use of street furniture and bike infrastructure. What potential do you see in that little triangle? A park? A bikeshare station? A patch of calm in the urban fabric that draws people together? How about all three? This little scrap of land, it turns out, has a lot going on: shaded benches, a line of bike racks, a heavily-used bikeshare station, and a perimeter of bollards to protect the whole thing. What could’ve been an urban afterthought is, instead, a neighborhood gathering point, serving commuters in the morning and evening, and friends and families in the afternoon and evening. By 7pm, that patch of sidewalk will be packed with local residents, eating frites and drinking Belgian beer, despite heavy traffic on the major avenue right out front. 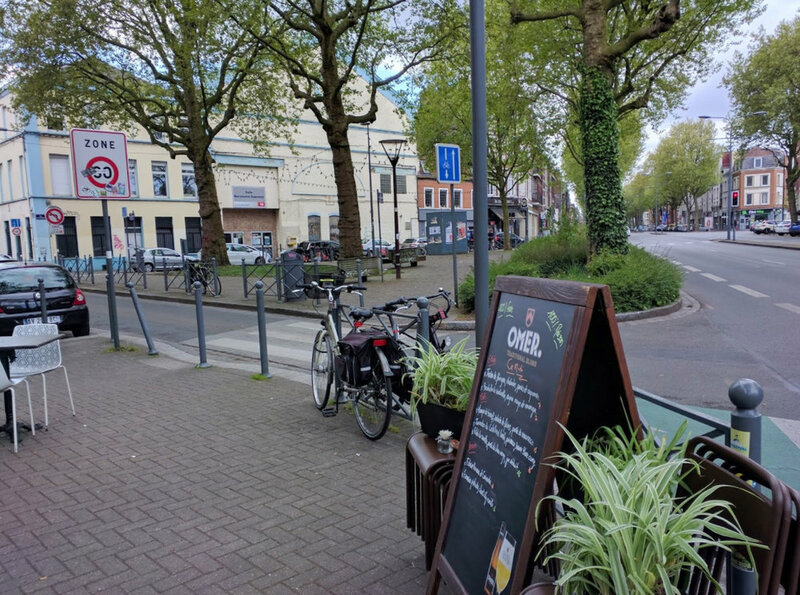 It’s a scene replicated all over town, and in countless other European cities: find an orphaned bit of land, protect it from traffic, add features that invite bikers and pedestrians, and you quickly have a little slice of community, that entices people outside and into local businesses. Obviously, there’s more to these wonderful public spaces than just some bollards and a couple of benches, but they couldn’t exist without them. Infrastructure does more than just provide a place to sit. It also defines a space and lays a foundation. And what these tiny parks—and thousands of others like them—clearly show, is that once that foundation is laid, amazing things can happen in the most neglected places. Nathaniel Burnett, cycling enthusiast and founder of The Bicycle Parking Project, hopes that his app will eliminate one excuse people have for not riding their bikes. The app utilizes both external data sources and user-generated content to create a map of existing bike racks. Users can plan ahead or instantly locate bike parking near their destination without scrambling to find a secure rack on foot. Publicly available data from many metropolitan areas including New York, San Francisco, and Chicago have already been imported into the app, populating several thousand bike racks per city. App users have occasionally supplied city data, too. A cyclist in Omaha, Nebraska, wanted local racks to be included on the map. He contacted the city to request the required information and forwarded the resulting data file to Nathaniel. Omaha’s bike racks were on the map later that same day. Users can add individual bike racks by quickly snapping and submitting a photo through the app. The new location marker and corresponding photo detail is displayed in real time, though Nathaniel monitors all submissions and deletes any that aren’t legitimate. User-added rack locations have popped up across the globe, including cities in Europe, India, Australia, and South America. Users can also report location markers where the rack is missing, typically due to an error in the data file. Before creating his own, Nathaniel tried using another bike parking app. He was disappointed that the new racks he submitted were never incorporated into the map and wanted his version to empower fellow cyclists to actively develop this community resource. The more users interact with the app, the more refined and helpful the map will become. For cyclists who don’t need help finding parking, the app has one additional tool: it allows users to drop a pin to mark the location of their bike. In areas where bike racks are prevalent or in unfamiliar neighborhoods, this feature ensures riders don’t forget where they parked. The Bicycle Parking Project app is available for both iOS and Android. While the number of downloads is still in the thousands, the positive feedback Nathaniel has received from users encourages him to continue the work. As the map becomes more comprehensive in local areas, it may also become a resource that city officials and business owners utilize to identify where there is an absence of bicycle parking. According to the 2035 Comprehensive Plan published last year, the city of Portland is expected to grow by 260,000 people in the next two decades. As any Portland resident will tell you, the current infrastructure does not support the transportation needs of today’s population, let alone this anticipated spike. To accommodate such rapid growth, the Comprehensive Plan advocates for solutions that will make Portland a more walkable, bikeable, transit-friendly city, by both increasing access to active transportation and rethinking how neighborhoods are developed. One of the proposed projects is construction of a six-mile pedestrian and bicycle “green loop” that will connect the inner east and west sides of Portland. The John Yeon Center for Architecture and the Landscape partnered with Design Week Portland to solicit creative proposals to conceptualize and design the loop. The winner of the competition, Untitled Studio, not only imagined an ecofriendly, multi-use transportation path but also introduced a collaborative process as the means to design it. Last month at Design Week Portland Headquarters, Untitled Studio revealed their vision for “Portland’s Living Loop.” The exhibit generated excitement for the project and included opportunities for audience engagement, mirroring the participatory process that will inform the green loop’s development in the years ahead. Though the loop will serve as a critical pedestrian and bicycle route across the city, Untitled Studio also positioned it as a destination and center of community. According to their model, the loop is divided into four lanes, corresponding to the Central City, District, Neighborhood, and Block. The purpose and design of each lane is decided by the people represented by the lane, from the city as a whole down to the individuals, families and businesses that reside along a particular block. 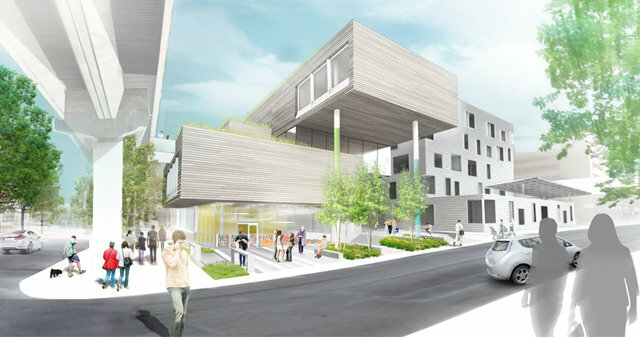 Images from Untitled Studio's green loop proposal, view the full proposal here. The possibilities for what the green loop could become are endless. Could the neighborhood benefit from an outdoor fitness space with fixtures installed for exercise? Would an urban garden plot be advantageous for a particular block or do businesses need space to install dedicated bike parking? Does the district want a central space for the community to gather, with ample benches for seating and trees for shade on hot summer days? According to the model, any of these options–and so many more–could be incorporated into the loop alongside the transportation paths. Image from Untitled Studio's green loop proposal, view the full proposal here. Civic projects of this scale are often dictated by the local government. Untitled Studio proposed this four-lane model as a way to engage the residents of Portland and ensure that the people who are most affected by construction of the loop are entitled to contribute to its design. Neighborhoods might hold town hall meetings or survey residents to identify solutions that best serve their community. Individuals and businesses on a single block might organize a potluck to meet each other and brainstorm ideas for their lane of the loop. How this participatory model of design will translate from vision to reality is uncertain. Construction of the green loop will take place in stages as funding is secured, with a few key portions already completed (Tilikum Crossing) or in development. Yet if this process is successfully implemented, it could become a model for numerous other pedestrian and bicycle greenway projects that are slated for development in the 2035 Comprehensive Plan. View the green loop presentation here. When the name of your apartment complex is Peloton, you pretty much have to get the bike amenities right. And the Peloton Apartments, recently completed on a rapidly growing stretch of North Williams Avenue in Portland, does not disappoint. For the non-bike-nerds out there, a peloton is a group of cyclists riding in tight formation, to reduce air drag during a race or group ride. It might seem like an odd name for a brand new, somewhat luxurious housing development whose tenants are more likely to be programmers than bike mechanics, but this is Portland after all, and the bike-friendly lifestyle takes all kinds. It helps that the Peloton’s three buildings are flanked on either side by two of the busiest bike routes in the city: in warmer months, rush hour traffic on North Williams and its southbound sister North Vancouver is upwards of 40% bicycles. Santoprene protects on the Burnside racks. So in addition to three rooftop decks and some beautifully tricked-out common areas, the Peloton also serves as a kind of showcase of great bike amenities. There’s a whole ground-level bike parking area in the main building, equipped with dozens of Huntco’s Burnside staple racks, their elegant rectangular tubing softened on the edges with Santoprene bumpers, to protect delicate paint jobs. And set back from the woonerf that divides the complex (a delightful Dutch-style alleyway, accessible to the public) is a protected bike room with more than 200 Huntco Hawthorne wall-mounted racks, perfect for that second (or third) bike you don’t use quite as often. Banking on the idea that several tenants will have bikes that they treasure and pamper, there’s an in-building Bike Club room with bench-mounted repair stands and a variety tools, and 10 gorgeous, mint-colored BV-1 bike lockers. Between these amenities, even the most road-obsessed tenant is going to feel well taken care of — an unusual value proposition for an apartment building. The net effect of all these amenities, so thoughtfully installed, is a sense that this is a place that really means what it says. There are plenty of new apartment buildings using bike-centric imagery or messaging to sound more current, or more eco-friendly, but for anyone really making a go of active transportation as a daily habit, this kind of infrastructure is more than just a nice afterthought — it’s a game changer. In addition to brewing beer in Asheville, New Belgium also constructed a 141,000 square foot distribution facility – essentially an enormous refrigerated warehouse – that employs dozens of local residents and earned LEED Platinum certification shortly after opening in 2015. The Huntco-built Fin bike racks out front were part of that, but they also send a message: that bikes and beer are part of a happy, healthy life, and that New Belgium wants to see more of both. a long-time employee who moved out to Asheville after the expansion. He goes on to explain that Asheville’s improving bike infrastructure, combined with New Belgium company incentives (employees get a free bike after one year on staff), has attracted workers inclined toward active transportation, and inspired others to give it a try. Having a great-looking place to lock up when you get to work certainly doesn’t hurt either. Recycling’s usually something we associate with beer cans, soda bottles and newspapers — simple things you can dump into a hopper and watch new products emerge from the other end (or something like that). Recycling’s not for anything big, expensive or useful we’re told, especially if we inquire about a damaged electronic gadget, and are advised to simply get a new one. In the early days of on-campus bike parking (more than, say, 10 years ago), racks were bolted into the concrete individually — a pretty labor-intensive approach when you’ve got thousands of bikes to accommodate. These days, the Bike Corral is the gold standard: four staple racks welded to two strips of plate steel for perfect positioning, better security, and faster installation. “We basically called up Casey [Rice, at Huntco],” says Culpepper, “and said ‘Can you take care of this for us?’” Over the course of a few weeks, we trucked over 100 used racks of various sizes, shapes and states of repair into our shop. We burned off the old chipped paint, cut off the mounting flanges, welded them into corrals, and sent them off for powder-coating. The result? 40 pristine corrals of consistent height and shape, in flawless PSU green, ready for installation. The cost? 40% less than buying new ones, not to mention massive energy savings by keeping the old ones out of the scrapyard. Culpepper explains that reuse is already a familiar option for PSU: a popular, long-running campus program has been refurbishing old bikes and providing them to students for years, part of an overall ethic of getting the most out of what you already have. As the campus continues to grow and evolve, and the fraction of students biking to school keeps rising, refurbished infrastructure doesn’t just make sense for the environment, it also makes sense for the bottom line. We’re in France this week! Well, one of our team is anyway, spending some time with family in the friendly northern college town of Lille. This being Huntco, what we’ve noticed about Lille, even more than the beautiful old cobblestone streets or the legendary beer (it’s only 30km from Belgium) is the bollards. 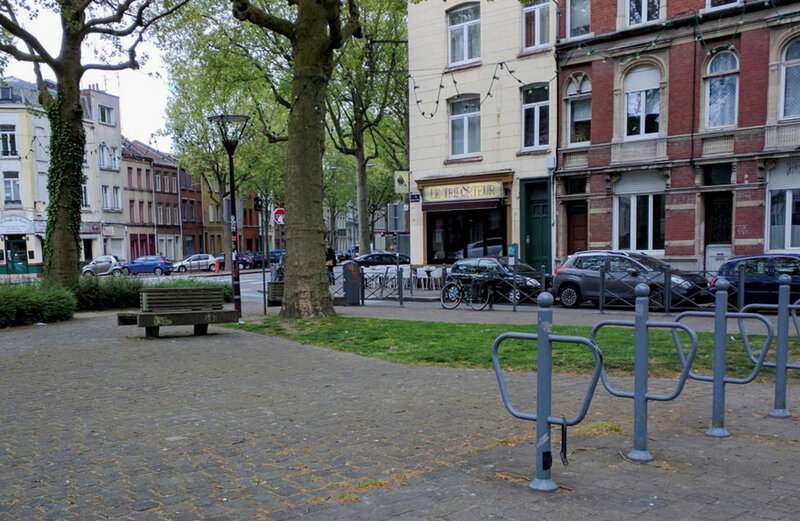 Like a lot of mid-sized French cities, Lille is a great place to walk and bike, with a wonderfully rich street life — and one of the reasons why is extensive and thoughtful use of bollards, in ways that might be surprising to folks in North America. The Place du Général de Gaulle is a good example. Usually just called the Grand Place (“big plaza”) by locals, this is a broad, brick-paved square fronted by bookstores, cafes, shops and a historic theater. It’s the undisputed heart of the city, frequented by thousands of people a day who come there to meet, shop, drink or just hang out. It also has a street snaking right through the middle of it, and a 422-space parking garage underneath. So how do open up a big, public space to cars without turning your beloved Place into a parking lot? In Lille, you do it with bollards. Using dozens of slender, elegant bollards at about 8 foot intervals, the city has demarcated a “street” that directs traffic through the plaza, while making it clear that cars are sharing the space with (far more numerous) people walking and biking. For pedestrians, the bollards just barely interfere with the flow of foot traffic, indicating where to watch out for vehicles but keeping the space permeable. For drivers, the message is clear: proceed to the underground parking lot, or keep moving, slowly, until you’re clear of the shared space. 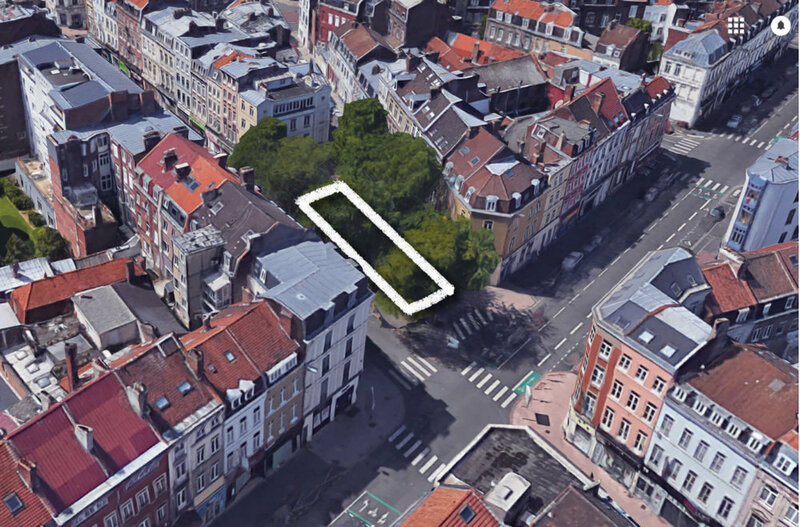 Just north of the Grand Place is another smart use of bollards along Rue Faidherbe, a short, majestic boulevard connecting the plaza to the city’s busiest train station. In this case, the bollards line the one-way street (with two-way bike lanes), protecting broad sidewalks full of shoppers while making it easy to cross at any point. Strategic gaps in the bollards define intersections with side streets, funneling cars in a predictable way without impeding walkers — and leaving plenty of room for the city’s cafe culture to thrive. Like the bollards that Huntco manufactures, these are unobtrusive enough that they become part of the urban fabric, not an interruption to it — in fact, they might even be a bit beloved. The city also uses different types of bollards to lend a sense of place to different areas. Here’s a different type of bollard as you head toward the are de Lille Europe — the newer train station where the Eurostar from London stops. You’d be hard pressed to find a city anywhere in the US that uses bollards so prolifically, or applies them so expressly toward directing cars, rather than just protecting pedestrian spaces. It’s a refreshing approach that could have some real impact in cities here, especially ones hoping to spur the kind of placemaking that’s clearly so good for business in cities like Lille. Oh, and in case you’re wondering, the word bollard is French! And if Lille is any indication, France may well be the bollard’s homeland. Story and photos by Huntco team member and world traveler Carl Alviani. One of the things we love about making bike racks, street furniture and other public amenities is how they can transform streetscapes, letting people know that this is a destination, not just a thruway. And one of the best examples of it just hit the streets of Portland, in the form of a new bikeshare system called “Biketown”. The bikes and the racks that make up the Biketown system aren’t just reliable and well-designed; they’re also orange. Bright, eye-catching, unignorable orange. The bold color (and the odd name) both stem from the fact that Nike (Oregon’s most famous company) kicked in several million dollars to make it happen. And no, in case you’re wondering, it’s not pronounced “Bikey-town” -- though plenty of us call it that anyway. Regardless of how you say it, the system’s impossible to miss. Driving through the city’s downtown or east side, chances are good that you’ll catch a glimpse of orange every minute or two, and the overall effect is powerful. Portland’s got plenty of bike infrastructure, of course, but if you’re not riding a bike, it’s easy to ignore. A 60-foot long row of bright orange fins, on the other hand, is a quietly exuberant reminder that bikes are part of what makes the city – as ordinary and indispensable as bus stops, storefronts and parking lots. It’s exciting because it means that everyone who travels through the city must, sooner or later, acknowledge the existence of biking here, not as a temporary anomaly, but a permanent fixture. It’s the sort of subtle shift in perception that organized rides and awareness campaigns try to engineer, but rarely succeed at. A similar shift happened when NYC’s Citibike program launched, helping to shepherd along a citywide embrace of bikes, bike lanes and bike commuting that eventually earned it the title of Best Cycling City in the US. Now, Huntco didn’t make these racks, but we love them just the same. They’re elegant, they’re sturdy, they look great. And more important, they make the city better for everyone. The Emery, a 7-story apartment building in Portland’s rapidly growing South Waterfront neighborhood, wears its eco credentials on its sleeve. A tight cluster of high-efficiency apartments, located next to a streetcar, light rail and aerial tram station and a major bike route, the Emery is actively marketed toward young professional singles and couples interested in active transportation and low-car living. For a building like this, a great bike facility is a necessity, not an amenity. An additional 20 Stirrup Racks are mounted in a publicly accessible hallway next to the bike room, providing covered parking for visitors and employees of the restaurants on the Emery’s ground floor. In smart, modern buildings like the Emery, every bike gets a civilized place to park. More Parking in the Pearl? Yes. We're proud to announce the new LEED-Gold-pursuing Pearl West building, designed by Hacker Architects and GBD, installed stainless steel Sol racks. They've done a beautiful job with the built-in outdoor furnishings to create a walkable, park-like space. We were lucky enough to get an install shot. Why do bike corrals look like that? Here in Portland, bike corrals are a big deal. These on-street rack clusters have been popping up in front of commercial and public venues since 2001, and the city currently boasts over 130 of them – more than any other city in North America, and enough to hold over 2000 bikes. You’ve probably heard about their advantages already: 10 times the vehicle density of car parking, better businesses visibility, improved pedestrian safety (especially when installed near intersections), not to mention the fact that bike-bound customers tend to visit more often and spend more. The way these corrals get designed and installed has changed a lot over the years, though, and their standardized form gives some great pointers for anyone trying to design a public bike parking area. Take a look at the Portland Bureau of Transportation’s official design drawing, and a few things immediately jump out. For one thing, every rack has breathing room: 28 inches between racks, and two feet from the curb. Years of trial and error have shown this to be the sweet spot, maximizing parking density while still letting riders fit a bike on both sides of each rack. And unlike those first corrals in front of PGE (now Providence) Park, which placed racks perpendicular to the curb, current corrals angle them in about 30 degrees. This keeps bikes from intruding too much on the active roadway--especially important when you’re parking a longtail with an extended wheelbase. The other big advancement is in how corrals get protected and accessed. Other early examples, like the corral in front of Stumptown Coffee on SE Belmont St, are completely surrounded by raised curbs and reflective posts, which do a great job of keeping cars out, but also make it tough to roll a heavily loaded bike in. Current designs put a raised parking block at either end, but leave the long, street-facing side open, marked off with a bold reflective stripe. Combined with bike-stenciled access spaces at either end, this creates a sort of miniature bike parking lot with easy roll-in and roll-out. The bad news, if you’re a street-facing business in Portland, is that these corrals are so popular that there’s a year-long waiting list to get one installed. The good news for everyone else, though, is that these principles work just about anywhere else, and the math is the same: a 29’ corral holds 12 bikes, versus just a single car when parallel parked. For more information, check out Huntco’s Bike Corral product page. The town of Milwaukie borders Portland just to the south, and it’s a lovely place to live. Besides its river views, great parks and gorgeous Craftsman houses, Milwaukie’s enjoying newfound popularity thanks to the recent arrival of the new Orange Line -- a light rail project that whisks residents to downtown Portland car-free in under 30 minutes. What it doesn’t have is a bike shop. For a community so perfectly suited to low-car living, this is kind of a problem. According to local group Bike Milwaukie, the number of families using bikes to get around has shot up in recent years, but they have to head north for repairs and tune-ups. So Bike Milwaukie had an idea: they might not be able to start up a new bike shop, but wouldn’t a publicly accessible bike repair station be the next best thing? Through a successful Kickstarter project, Bike Milwaukie and 33 (mostly local) donors banded together to raise $2800 for a high-quality bike repair stand, built by Minneapolis-based Bike Fixtation. The stand, purchased through Huntco, features Allen keys, screwdrivers, tire levers, pedal, headset and cone wrenches, and a heavy duty pump: everything you need to conduct basic maintenance and quick fixes. Better yet, the organizers at Bike Milwaukie worked with the local government to get the stand installed in a high profile location right in front of City Hall. Even though we didn’t build this particular piece of infrastructure, it’s nice to be reminded how the right amenity in the right place can do more than just fill a need — it can help focus an entire community. Laying the groundwork for walkable neighborhoods. Is your neighborhood walkable? Is it walkable enough? According to some recent articles, walkability is now the single most desirable trait for house hunters in US cities, and it only seems to be getting more desirable. This shouldn’t be all that surprising. After all, Millennials are now the largest generation in the country, they’re heading into their settling-down years, and they’re famously less interested in driving than previous generations. On top of that, you have millions of aging Boomers looking to downsize, often in places where they won’t have to spend as much time in their cars. This doesn’t have to mean a city–lots of suburbs are getting more pedestrian-friendly–but it does mean distances short enough to make walking a viable alternative to driving. But it also means infrastructure: sidewalks, shade trees, street-oriented storefronts, and--you guessed it–site furnishings. Installing benches, tables, bollards and bike parking doesn’t automatically make a block a walker’s paradise, but you’d be hard-pressed to find a walkable neighborhood without them. Besides giving you a place to rest your bones after a long stroll, street furniture also sends a powerful message: that people are supposed to be here, that walking is a viable form of transport. Backless Willamette benches at the Northwest Atlanta library in Georgia. Sol racks, zebra crosswalks and and 6" bollards invite cyclists and protect pedestrians at New Seasons market at 33rd and Broadway, Portland, Oregon. 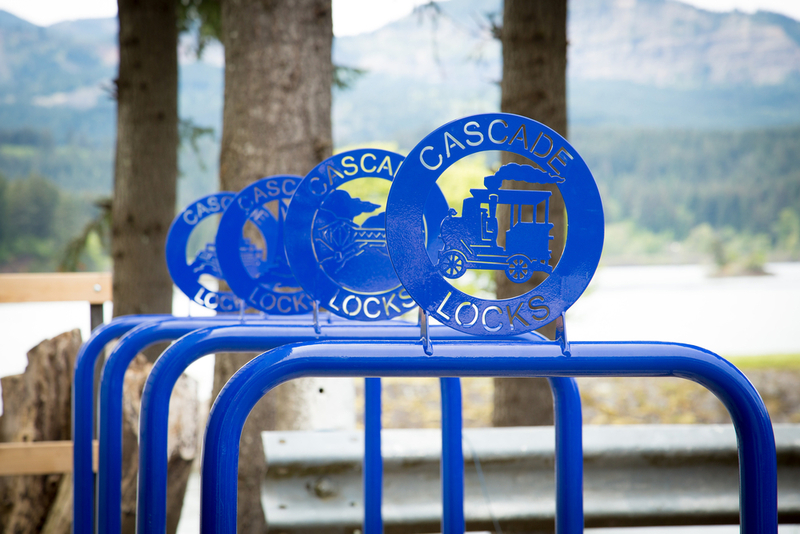 Cascade locks artist-designed bike racks. Santiem benches at Daimler on Swan Island, Portland, Oregon. What can you do with a customized rack? We’ve been making customized bike racks and site-specific furnishings for years, but I’m pretty sure this is the first time we’ve fabricated cats. The racks (which work just like a typical Sol rack) are instantly recognizable as cat faces, but with a unique detail: the flat-topped ear on one side is what’s called an “ear tip”, and it’s a standard indication that a stray has already been spayed or neutered. So in a way, the racks help spread the word about spaying and neutering without saying a word. Because we do all of our fabrication here in the US, Huntco is able take on all kinds of custom orders, often on short notice and based on simple, straightforward descriptions from the client or architect. Besides being a lot of fun for us — who wouldn’t want to fabricate an enormous cat face out of powder-coated steel? — they also add unmistakable character to the streetscape, and help organizations announce themselves in a way that’s a lot more approachable and distinctive than another sign or billboard. This project was in Portland, but people are looking for secure, functional bike parking in cities all over the US. Here’s hoping more of it has a face that makes you smile. See more examples of custom bike rack and site furnishings here. Adding a bike share system is an excellent way for any major metro to cut down on traffic, add easy travel options for tourists and city dwellers alike, and boost local economy. Cities nationwide are implementing public and private programs, each with a different way of payment and different share policies. The question for bike share planners: Is there a simple method for people to share bikes? The Portland program, set up at Oregon Health & Science University (OHSU) campus, is the latest site to try out the bike share model that was originally developed at Intel® and has been further explored by the Open Bike Initiative. Even though a high tech company designed the system–there is not a lot of tech involved–making the system simple and easy to use. The Go By Bike share at OHSU uses distinctive blue bikes, blue metal bike racks by Huntco, and a combination U-lock for secure bike lockup. OHSU employees and students, who register with an OHSU email, can choose a bike from the rack and text a number to receive the bike’s specific U-lock combination. Users can access the system within a day of signup. The open-source lock-based system lowers the barrier of capital startup costs, which for Docking systems can be out of reach for smaller budgets. Docking stations are around $50,000 each, require a power source, and the bikes must be locked to a slot in the dock. Kiel Johnson, the owner of Go By Bike, estimates that this 2-node, 13-bike system costs under $9,000 to set up. He also notes "Setting up the technical part of the system costs $900, the only other part are custom racks and bikes + maintenance…great for businesses and campuses." Using locks facilitates a more conventional bike usage style. Cyclists can ride and run errands as they wish, without having to worry about finding a specific docking station while using the borrowed bike to avoid overtime fees. Docking stations can be necessary where urban bike parking is sparse or inconsistent. These docking stations are a way to claim public space, and ensure a safe location out of high traffic areas. This is less of an issue when an area has plenty of space in the form of protected racks and lockup areas. It is yet to be seen if docks or locks are the better long-term answer. The appropriateness of each structure will vary from city to city and will depend on the existing views regarding bikes, infrastructure, and political disposition. Starting in the summer of 2016, Portland, Oregon will experiment with a hybrid of dock and lock methods. The large-scale 75-station/750-cycle system, run by Motivate (of CitiBike fame) will feature credit card payment machines at bike drop-off/pick-up locations. The custom bikes come with smart locks and can be parked at any rack for the duration of the cycle trip. Bikes will need to be returned to a Motivate station when the cyclist is finished with their excursion. Smaller, DIY operators that are interested in providing low-maintenance/-infrastructure bike shares have the potential to crop up all over Portland. Neighborhood associations, facility managers, small businesses, campus associations, city councils, and hospitality ventures have a vested interest in promoting bike share systems. The Ace Hotel, a Portland fixture, has started its own bike share program and offers house bikes to borrow for free, or hotel patrons can rent custom made cycles (by Jordan Hufnagel) for a reasonable price. Needless to say, having your brand roll around the city can’t be bad for business. Whether bike shares come from large corporate ventures, or DIY small business; regardless of which method, docks or locks, are used; it is clear that with the rapid growth in Portland proper and the nation’s other cities, there is a need for accessible and affordable transportation. Got an old bike languishing in the garage? Here's a quick round-up of spots in PDX to donate your old wheels/parts. We operate a full-service bike shop, and we love helping riders build their skills and confidence. Our programs and projects benefit underserved communities allowing kids to ride to school, adults to ride to work, and many people to ride for health and recreation. Bikes For Humanity PDX (B4HPDX) is a local, public charity project providing affordable refurbished bicycles to riders of all economic backgrounds. Are you making it easy on bike thieves? Have you had a bike stolen this year? It wouldn't be surprising. In 2014, over one million dollars worth of bikes were stolen from owners in Portland. Our fair city has been featured in the national news for bike theft, and even international visitors have had their bikes stolen (and luckily found again) on their way through town. Local business owner, J. Allard of the Project 529, wondered if we have some Mission-Impossible level bike thieves here in Portland. Is it special ops bike thieves or misguided folks tying their bikes to racks with rope and hoping nobody comes along with a pair of scissors that is causing the problem? J and his team conducted a census of 2,500-bike riders this summer to get to the heart of the issue. The team explored how Portlanders were locking up their bikes and it is an eye-opening read. 60% of bikes secured only the frame or a wheel, but not both. Thieves routinely will grab an unsecured front wheel from one bike and seek out a second bike securing only the front wheel and assemble a fully ridable and sellable bike in minutes in dense parking areas with little suspicion from passerby. And really…did someone actually lock their bike up with a piece of rope? Find out here in J's article "Dear Portland, Please Stop Making Things So Easy for Bike Thieves."